BOND: Revisiting LICENCE TO KILL | Warped Factor - Words in the Key of Geek. There are few Bond films as divisive amongst fans and critics than Timothy Dalton's second outing as 007. 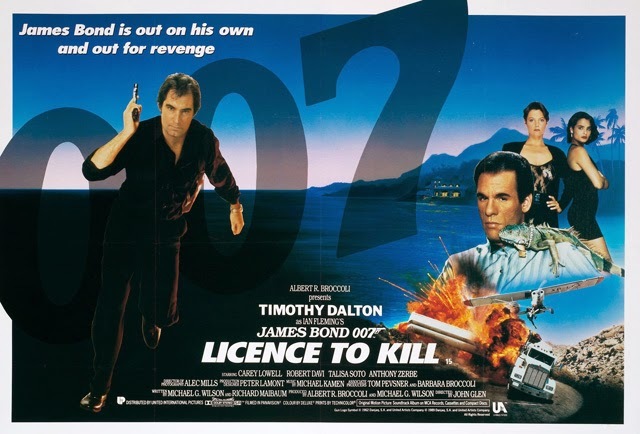 Since its release in 1989, Licence To Kill has been the most marmite of the Bond films: you either love it or hate it. If you fall into the latter category than you're about to be disappointed. Having proven that Dalton's more serious Fleming-like 007 could work, the team at EON did something unheard of for its time: they took Bond out of Her Majesty's Secret Service, took away his 00 number, and put him outside his normal operating parameters. In doing so, they created one of the best James Bond films. First off, we get the best performance to date by a Bond actor. Timothy Dalton had proved in The Living Daylights that he had the acting chops to play 007 and here, he surpasses not only himself, but also every other actor who has played Bond. This isn't the tuxedo wearing super hero of the Roger Moore era: this is a Bond who can be cold-blooded, almost humor-less, and also a human being. Dalton thrives on the script, from the scene where he finds Della dead, to his reactions to finding Killifer in the warehouse. His resigning from MI6, and other scenes in the film prove that he has studied the character of Bond enough to get inside the characters' head and become him. Dalton also thrives in his scenes with others, especially with Sanchez, which are among the best Bond-Villain scenes since From Russia With Love and the early Bond films. That isn't forgetting the action sequences where Dalton excels as well to the point that, like in The Living Daylights, it can be hard to tell when it’s him and when it’s a stuntman. The villain, Franz Sanchez, is among the best villains, and the more realistic, of the series. Sanchez is not only a drug lord from South America but in many ways a mirror, albeit evil, image of 007. Much like Scaramanga in The Man With The Golden Gun, the relationship between the villain and Bond is complicated and there are some fireworks in their scenes. First there is the silent menace and quiet tension in the scene in Sanchez's office, and later a friendship between the two men that the audience and Bond know to be false. Sanchez has a lot of menace to him that had been missing from many Bond villains before him. Look at the scene where Lieter is fed to the shark, Sanchez looks menacing enough to kill Lieter, but he is evil enough just to maim him and leave him for dead. Sanchez's loyalty issue leads to the self-destructive paranoia and doing Bond's bidding by killing off most of his own inner-circle. With those actions, Sanchez sets himself up for the trap that leads to the destruction of not only his empire, but also the end of his life. It's a great twist of irony in the end that Sanchez is killed by the very man who caught him in the teaser and whom he trusted. Robert Davi does incredibly well in the part and is very believable, one of the more memorable villains to come out of the franchise. As for the supporting cast, top notch to say the least. Talisa Soto does well in the part of Lupe, though it is hard to feel for her character due to her limited time on screen, but she shines nevertheless. David Hedison makes a fantastic return as Felix Lieter. Despite being much older than the last time we saw him, Felix is still in good shape, and doesn't come across as old when firing a M-16 rifle at the bad guys in the teaser. When the shark maims him, we're shocked at it and even more shocked when Bond finds his bloody and barely alive body at his house. Mostly the goons of Sanchez make up the rest of the supporting cast, led by a young and very impressive Benicio Del Toro, whose talents have improved tenfold since this film came out over twenty-five years ago. Truman-Lodge, Heller, and Krest are great characters, though they are a bit underused in the film. At least Krest gets a good death sequence, in one of the most original deaths of the series. Joe Butcher is a fun character and well played by Wayne Newton, though a little out of place in this particular Bond film. The role of Q is increased big time for Desmond Llewelyn as he gets the largest Q part in the series and shines in the process. Robert Brown returns as M for the final time and finally manages to step out of Bernard Lee's shadow for the scene at the Hemingway house in Key West. Caroline Bliss returns also for the second and final time as Moneypenny and, as in The Living Daylights, doesn't spend enough time on screen to make an impression. The film's action sequences are among the best in the series. The opening teaser finds Bond for the first time not on a mission for MI6, but instead getting involved in events alongside his old friend which will end up drawing him into the plot of the film. The underwater/water ski/airplane sequence that takes later in the film is another inspired action sequence which showcases some of the best stunt work in the history of the series. 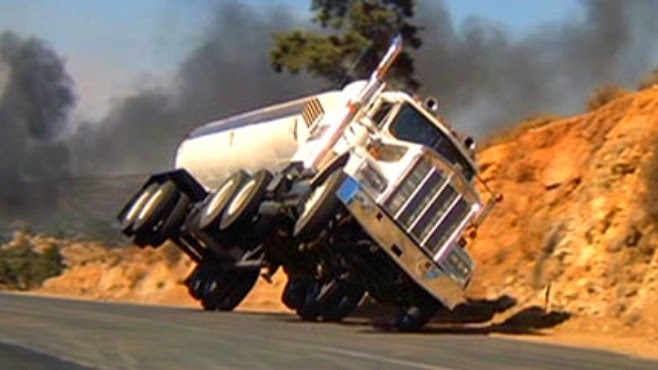 The final action sequence in the film, the truck chase, is a tour-de-force piece of stunt work with writers and stuntmen alike pulling out stop after stop leading to an incredible climax. Elsewhere, the various fights in the film are also good, especially the bar fight and the fight on the back of the runaway truck between Bond and Sanchez. The film has less action then The Living Daylights, but manages to surpass those action sequences and the plot never suffers. The film's plot is among the most notable in the series. As with For Yours Eyes Only at the start of the decade the script makes strong use of many elements drawn from the Fleming Bond canon, including Lieter's maiming by a shark in the Live And Let Die novel, and the Krest character from The Hildebrand Rarity short story. The sub-plots of the Japanese drug lords and the Stinger missiles help to complicate the film, but also bring plot elements from the 1950s to the then present day. Indeed, all things considered, the plot presented here might very well be what Fleming himself might have been writing about had he been alive and still writing Bond adventures in the late 1980's. If there is a bad thing about this film it's the score and songs. When John Barry came down with oesophagus cancer, EON hired the late Michael Kamen (perhaps best known for his scores for films such as Die Hard and Lethal Weapon, as well as his award wining score with Eric Clapton for the thriller serial Edge Of Darkness) to do the score. Unfortunately, Kamen produced one of the worst Bond film scores. Like Monty Norman in Dr. No, he makes way too much use of The James Bond Theme, to the point that it often feels like that's all the score is. Elsewhere, the song used for the film are, for the most part, a letdown. The main title song, performed by Gladys Knight is instantly forgettable, as are the Wedding Party and Dirty Love songs used in a couple of other scenes. The only good song to come out of the film is "If You Asked Me To", it is a pretty good song, though it does kind of feel out of place in a Bond film. While Kamen would produce some strong scores in his carer, his sole Bond outing isn't a highlight by any means. Despite a terrible score, Licence To Kill is a great Bond film. With the best Bond performance of the series to date, a great villain, a good supporting cast (though some of them are out of place), good action sequences, and a good plot, it appeared that the series was well set to enter the 1990s. Sadly the series would run into legal troubles within a year or so of the film’s release. That fact, coupled with the somewhat muted response to the film in the United States, led to the perception of it being a failure. Time though as proven otherwise with Licence To Kill becoming a classic 007 movie, with a Bond that was in many respects ahead of his time.